Possum haw, or deciduous holly, is usually a shrub with a spreading, open crown; it is sometimes a small tree. It is eye-catching in fall and winter with bright red berries. Leaves are simple, alternate or in clusters on short spurs; 2–3 inches long, widest at the middle and tapering at both ends. Tip blunt, margin mostly with round or blunt teeth. Bark is smooth, thin, mottled gray to brown, sometimes with numerous warty protuberances. Twigs are drawn out, slender, often with many short spurlike lateral twigs, light to dark gray. Flowers April–May. Some plants may be male, others female, or flowers may be perfect (containing both male and female parts). Petals 4–6, white, egg-shaped; stamens 4–6. Fruits September–October. Globe-shaped berry; orange to red; ¼ inch across; solitary or 2 or 3 together; seeds usually 4, pale yellow. Berries persistent on branches most of the winter after leaves are shed. As with other hollies, only female trees produce berries. Similar species: Missouri has 4 species in genus Ilex. Height: to 30 feet; generally smaller (as a shrub). Possum haw is occasionally planted as an ornamental and for its value in attracting birds and other wildlife. Deciduous holly (possum haw), with beautiful red berries, at the MDC Southeast Regional Office in Cape Girardeau. Of the two native Missouri hollies that lose their leaves each fall, possum haw is the one that is more common. It occurs in a variety of wet or dry habitats throughout the Ozarks and southeastern lowlands, but it is absent from much of northern Missouri. It prefers dolomite glades, rocky upland open woods, fencerows, borders of upland and lowland ponds, swamps, sloughs, valleys, and low, wet woods along streams. 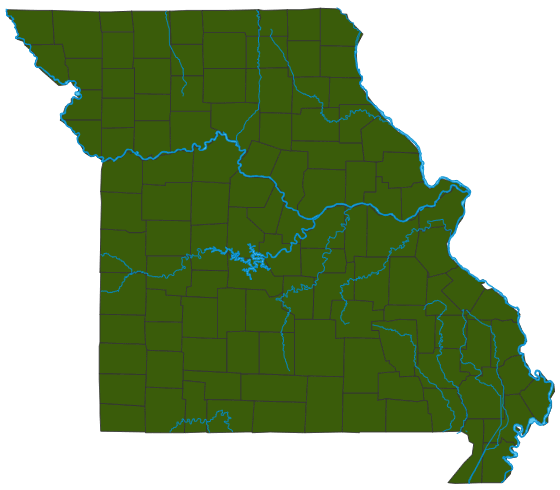 Ozarks, Mississippi Lowlands, and in counties bordering the Mississippi River. Planted statewide as an ornamental. Occasionally planted as an ornamental and for its value in attracting birds and other wildlife. As with other hollies, only the female plants will bear fruits, and these require the presence of a male plant. Thus to have a possum haw with berries, you will need at least two plants. Many species of birds and mammals eat the berries, and deer browse the twigs. The bright red berries seem to be ignored by wildlife for months but eventually are consumed later in winter as either their taste improves or other wild fruits become scarcer.